While the phone has become one of the most effective means of communication and marketing tools, the art of selling over the phone has become an important “science”, known as telemarketing. Consequently, telemarketing services became a successful business where customers buy products or solutions and feel their needs are met. It would be good, probably, to mention here just its primary types – inbound and outbound telemarketing. With no doubt, every company wants to find the call center that best fits its requirements. 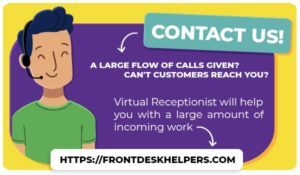 A lot of them will offer you inbound call center solutions. But to get good results on the first point of contact with a company can do just best ones. Same with outbound services, another way to grow your company’s profit. Appointment setting, either business-to-business or business-to-consumer calls, lead generation, market or data research… These are the services that are the most popular now. But there are a lot of others that customers can order as well. Most of all call centers have their own software that best fit your company’s needs. Finally, our company – Frontdeskhelpers – has a well-built infrastructure and professional personnel to quickly get your campaign up and running. I agree to my information being processed by Front Desk Helpers. We do not share your information with any third parties. we help you to cut out up to 65% of your expenses. "5 reasons to hire remote employees" with answers:`, `Need to cut down 65% of your company's expenses? "5 reasons to hire remote employees"
with a thematic white paper:`, `Your expenses higher than you expect? Get to know how to cut them down up to 65%! and schedule a call with us:`, `Are You a Small business owner? Would you like to save up to 65% of your expenses? "5 reasons to hire remote employees"`, ` Are you running a small business?